Quartzo collectable. RUSTY WALLACE. "MILLER GENUINE DRAFT". Included are. #73, "Newsweek", Le Mans 1980, part# 3008. #78, "BP", 5th Le Mans 1982, part# 3003. #61, "WERA", Le Mans 1981, part# 3004. #85, "Sun System", Le Mans 1980, part# 3010. 26 quartzo 1/43 scale nascar collection. Not all car have original outside box as shown in photo. All cars are in great shape. See photos for drivers included. In the original box as pictured. I do not believe that it was ever removed from the base. It was previously displayed in a glass case by a collector. Up for sale is a Quartzo Die Cast Car, 1/43 Scale, John Andretti #37 Kmart, Ford Thunderbird in good pre-owned condition although case and box have condition issues. And who better to be driving this car than the legendary Graham Hill. See condition information for this model above. GEOFF BODINE #7 QUARTZO COLLECTIBLE 1:43 EXIDE BATTERIES. Car is NEW - Still in Factory Box. Terry Labonte - Chevy Lumina - Kelloggs. These are well taken care of cars. Car and case are near perfect. Box has little if any shelf wear--see photos. Condition: case excellent-car very good-decals very good.RICK MAST'S #1 SKOAL RACING EARLY 1990s (1994?). FORD THUNDERBIRD NASCAR. See condition information for this model above. Quartzo 1/43rd Scale Diecast JEFF GORDON Chevy Lumina Dupont Paints. Trouble with making photos clear. These are well taken care of cars. Car and case are near perfect. Box has little or no wear. Lotus 72D Dave Walker British GP 1972 QUARTZO 4023 1/43 John Player Special. Never removed from box. Please see pictures. US BIDDERS ONLY. Thanks for looking. Box may show signs of handling. For sale is a 1:43 scale die cast model of Terry Labonte's #14 Kellogg's Corn Flakes Chevy Lumina NASCAR. The model is in great condition, however no longer has the outer cardboard box. 2015 Chevy lumina Kodak. small crack in case as shown in picture. You can check them out at. This item was acquired from an estate sale. It may or may not have been opened. In original box which may or may not show signs of damage. Please see pics. Vehicle has no damage but shows signs of age. Will be shipped in bubble wrap for protection. Remember I ship fast! For sale is a 1:43 scale die cast model of Ricky Rudd's #5 ultra Tide Chevy LuminaNASCAR. The model is in great condition, however no longer has the outer cardboard box. Rare #26 Richie Ginther Honda RA272. Quartzo / Vitesse put these out in ?. with a production run of. Keep in mind that when I talk about the condition of the boxes, sleeves or the car that we do not believe that there is a flawless car out there. #2018 Morgan Shepherd Ford Thunderbird - Citgo. Car and case are near perfect. These are well taken care of cars. The box has wear from sitting in storage. If we don't know the answer, we'll do our best to find it. NOTE: We list for family, recently retired friends, and ourselves. 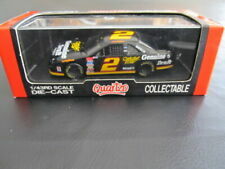 Quartzo 1:43 scale die cast Rusty Wallace Ford Thunderbird Miller Genuine Draft stock car. New in the box. Never been played with and the box is in very good shape. #2024 Darrell Waltrip - Chevy Lumina -Western Auto. These are well taken care of cars. Car and case are near perfect. Box has little or no wear. WINNER AT THE 1985 NORISRING RACE. BY QUARTZO. 1985 PORSCHE 956 SHORT TAIL #10 TEAM D & W. THIS IS A GREAT ADDITION TO ANY PORSCHE RACING COLLECTION. 1:43 SCALE. ON A BLACK PLASTIC 6 BY 3" STAND WITH A PLASTIC CLEAR COVER. Quartzo DieCast 1/43rd Scale Terry Labonte Chevy Lumina Kelloggs NASCAR Car, this is NEW in the box. Looks like the car is in a plastic display case, there was a sticker on the top of the case that left a bit of glue residue, minor shelf wear on the case and the box, car has never been removed from the box. For sale is a 1:43 scale die cast model of Derrike Cope's #10 Purolator Filters Chevy Lumina NASCAR. The model is in great condition, however no longer has the outer cardboard box. Condition is Used. Box has been opened and one flap torn off. Car and case like new. These cars are well taken care of. This is produced by Quartzo and is model 4022. This is in very good condition and was used for display only. #2023 Brett Bodine Ford Thunderbird - Quaker State. These are well taken care of cars. Excellent condition. Car and case are near perfect. Box has virtually little if any shelf wear-- see photos.